The Falkland Islands are an overseas territory of the United Kingdom, referred to by Argentina (which also claims the islands) as the Islas Malvinas. 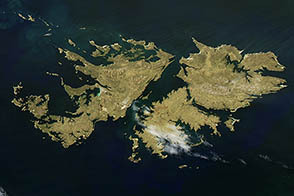 Falkland Sound, which is 12 kilometers (7.5 miles) wide at the narrow point, separates the main islands of East Falkland (image center) and West Falkland (along image left). Together they total about the same area as Connecticut or Northern Ireland. The islands lie almost 500 kilometers (310 miles) from the Argentine coast and less than 1,000 kilometers (620 miles) from Antarctica. The first flights to these remote islands were only implemented in 1971. The capital city, Stanley, lies on the eastern tip of East Falkland. The local inhabitants are mainly English speakers, and interestingly, the islands have become a center of English-language learning for students from South America. The windy and relatively dry climate, which includes roughly 600 millimeters (24 inches) of precipitation annually, has given rise to natural vegetation comprised of treeless grassland with scattered bogs. The grasslands are ideal for sheep rearing—the dominant occupation until recent decades, when fishing (mainly squid for Spain) and tourism became the mainstays of the economy. 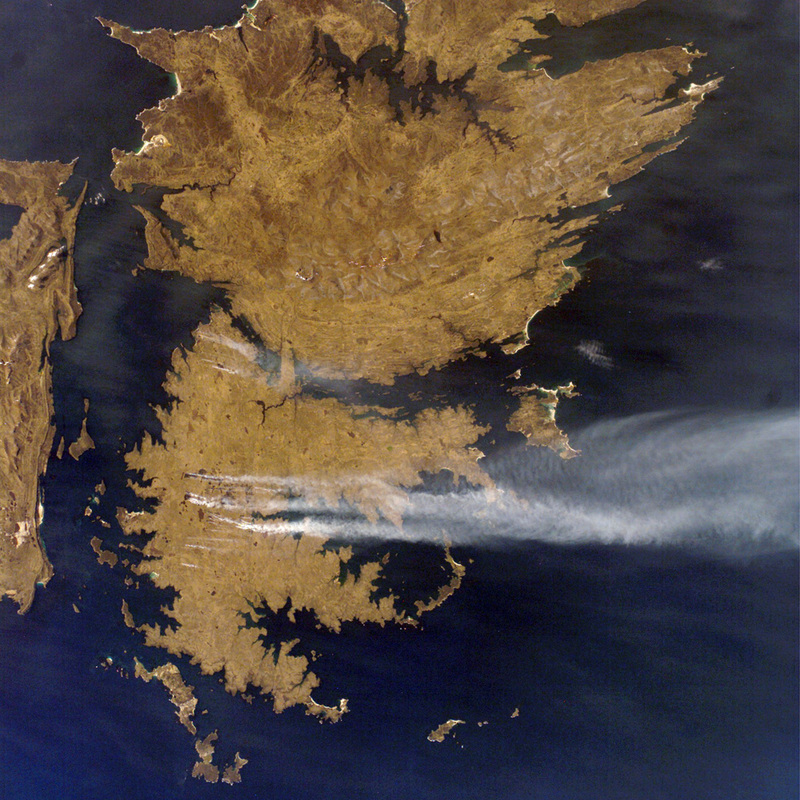 These expanses of grassland provide ready fuel for fires, as indicated by the several long smoke plumes visible in this astronaut photograph. This near-nadir image (looking almost straight down) was acquired at the southernmost extent of the International Space Station’s latitudinal orbit range of approximately 52 degrees north to 52 degrees south relative to the surface of the Earth. Astronaut photograph ISS015-E-30526 was acquired on September 25, 2007, with a Kodak 760C digital camera fitted with a 58 mm lens. The image was taken by the Expedition 15 crew, and is provided by the ISS Crew Earth Observations experiment and Image Science & Analysis Laboratory, Johnson Space Center. The image in this article has been cropped and enhanced to improve contrast. Lens artifacts have been removed. The International Space Station Program supports the laboratory to help astronauts take pictures of Earth that will be of the greatest value to scientists and the public, and to make those images freely available on the Internet. Additional images taken by astronauts and cosmonauts can be viewed at the NASA/JSC Gateway to Astronaut Photography of Earth.